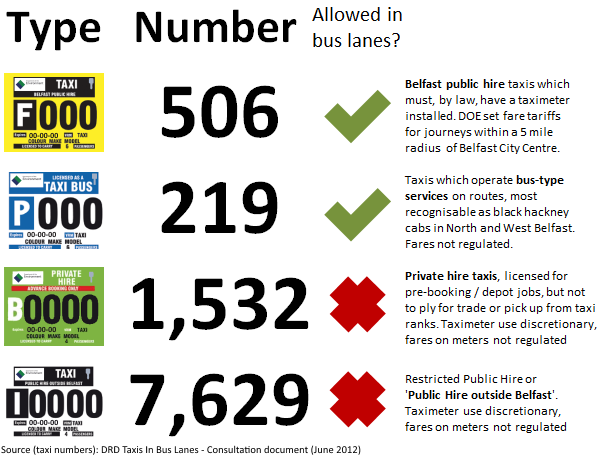 In 2013 hundreds of people with an interest in protecting cycling took to the streets of Belfast, signed a petition or engaged their politicians to stop thousands of taxis being allowed into bus lanes. The issue disappeared, but this wasn’t a victory – simply a delay. Decisions in the next few weeks will determine the future of sustainable transport in Northern Ireland. Department of the Environment (DOE) Minister Mark H Durkan has now announced a timetable to implement Taxi Reform, with single-tier licensing expected to become operational in January 2015. But what does that mean? These licence distinctions will disappear in January 2015 (with some potentially crucial categorisation remaining) with all taxis able to ply for hire in the street. DOE’s single-tier licensing puts the ball into DRD’s court on bus lane access, with the definition of a “permitted taxi” in bus lane regulations no longer a simple matter. Between DOE (road safety portfolio) and DRD (Cycling Revolution™ portfolio) there now exists a tiny window of opportunity to properly understand the negative impacts of taxis in bus lanes and set a clear priority for sustainable travel in Northern Ireland. 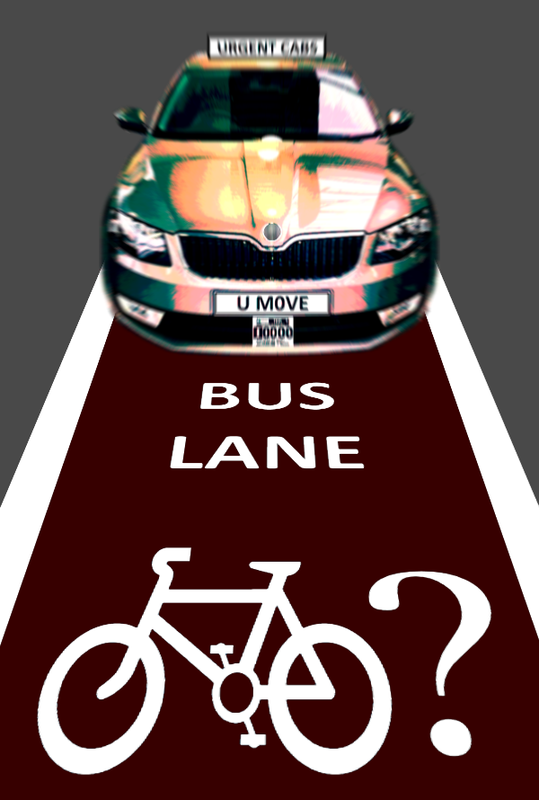 Over the next 2 weeks I’ll examine a series of issues around taxis in bus lanes – from cycling safety and why people plan to give up cycling as a result, what the experience has been in Dublin, why taxi firms grossly overplay the importance of bus lane access (and underplay their own impact), to why bus lanes are not true #space4cycling but an essential stepping stone, and why this decision is completely at odds with DRD’s strategic vision for cycling. Finally I’ll make the case for a solution which has the broadest backing among interested groups, not least the consultants DRD paid to assess the performance of bus lanes..
Keep the conversation together on social media by using everyone’s favourite taxis in bus lanes hashtag..
Taxis in bus lanes drew me unwittingly into cycle campaigning 2 years ago, dismayed that DRD’s consultation had gone virtually unnoticed in Northern Ireland..
And it’s worth reading that original consultation for the stunningly inept policy process, flying in the face of public opposition, evidence of harm and outside expert recommendations..
My own response is interesting in hindsight – high-quality #space4cycling alternatives didn’t make the cut. I (rightly) suspected they would be laughed out of the room – ironically, DRD’s awakening to cycling since 2012 has now made this viable, albeit in the medium term.. The post that kicked off the fightback, as people in Belfast started to organise and made February 2013 a pivotal month.. The NI Roads blog looked at DRD’s consultation and penned a violent evisceration more in keeping with an episode of Game of Thrones. This was released on the same day as the late Tom McClelland was leading a street protest..
My last written contribution was in defence of the perception of safety, clearly ignored in so much decision-making at DRD but fundamental to understanding why keeping bicycles and taxis apart is so important.. Along with the gathering momentum of politicians realising how important the issue was, a petition was organised and handed in to Transport Minister Danny Kennedy..